Tennessee Triumph Cookbook is a commemorative collection of vintage and current recipes. 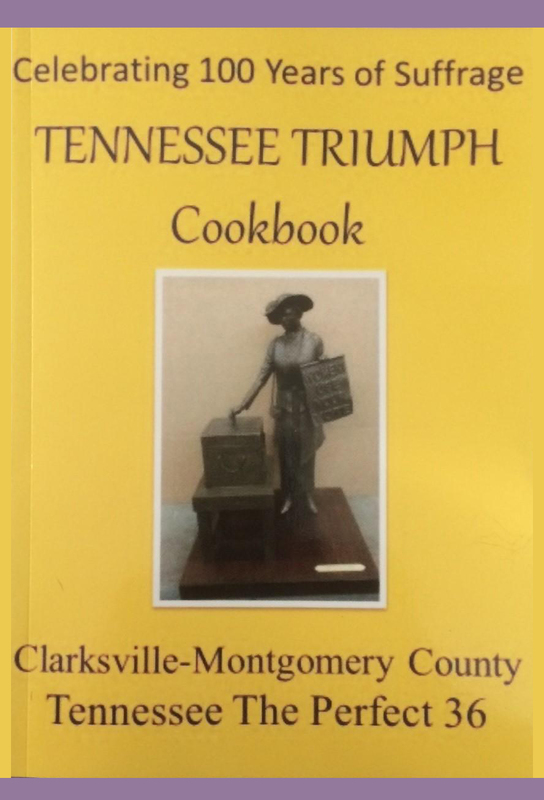 It honors the efforts of the women of Clarksville-Montgomery County, Tennessee who worked for Suffrage and helped Tennessee become “The Perfect 36,” the necessary final state to ratify the 19th Amendment to the United States Constitution in August 1920. 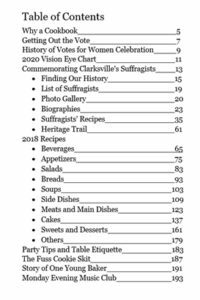 The book includes details about some of those Suffragists and the tasks undertaken by volunteer researchers to rediscover their forgotten story. It is a story echoed in communities across the country, not of the famous stars of the Suffrage movement, but of dedicated advocates who persisted year after year in a small Middle Tennessee town. Thirty-nine women have been identified so far, with research continuing. 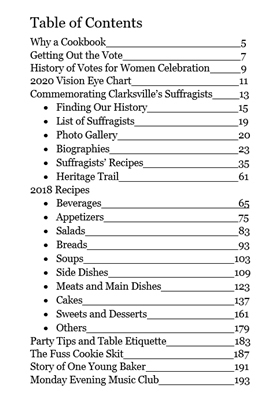 Clarksville is erecting a statue, Tennessee Triumph, to honor and remember them in the 100th Anniversary of Woman Suffrage. All proceeds from this book help fund the statue. Available from Sango Family and Community Educators. Make checks payable to Sango FCE. Three attorneys will be featured on the Memphis Suffrage Monument to be located on the river side of the University of Memphis Law School. Unveiling for the monument is planned for Sunday, August 18, 2019. The state House of Representatives ratified on that date in 1920. This monument will be part of the TN Woman Suffrage Heritage Trail, the Memphis Heritage trail, and the National Votes for Women Trail. Any donation is welcome and is tax-deductible. Donor names of $1,000 per person or $1,500 per couple will be lasered in the glass. Mail checks payable to Vote 70, Inc., and mail to: Paula F. Casey, 99 N. Main St., #901, Memphis TN 38103-5005. If you have any questions, send e-mail to pfcasey@bellsouth.net. Marion Scudder Griffin was the first female attorney in Tennessee, as well as the first woman to serve in the Tennessee House of Representatives. Upon moving to Memphis, she worked in Judge Thomas M. Scruggs’ office as a stenographer and also began studying for a law license. On February 15, 1900, she was certified by Chancellor Dehaven and Circuit Court Judge Estes for admission to the bar. Despite her certification, the Tennessee Supreme Court denied Griffin a legal license in 1900 and 1901, because of her gender. Undeterred, she was one of two women to receive a Bachelor of Law degree in 1906, from the University of Michigan Law School. Returning to Tennessee, she lobbied the state legislature to pass a law that would grant women the right to practice law. Though she was initially derided, she convinced the legislature and a bill was passed on February 13, 1907, and signed two days later by Governor Malcolm R. Patterson. On July 1, 1907, she was licensed by the Tennessee Supreme Court and sworn in as a member of the local bar. She went on to practice law in Memphis from 1907 to 1949. In 1922, Griffin became the first woman elected to the Tennessee State House. As was noted in a Commercial Appeal article of August 3, 1950, she had the support of public figures like C. P. J. Mooney, the newspaper’s editor, during her campaign. She served for one term, headed the House Social Welfare Committee, and promoted legislation affecting women and children. She was an active member of the Memphis Business and Professional Women’s Club and the Memphis League of Women Voters, and was one of the charter members of the Memphis Chapter of the American Association of University Women. Marion Scudder Griffin died on January 30, 1957, and was buried at Elmwood Cemetery. Joseph Hanover came to the United States from Poland at the age of five with his mother. His father had come earlier to begin a new life, save money, and send for them. Later, Hanover became a lawyer in Memphis and served for one term, 1919-1921, in the Tennessee House of Representatives. He argued eloquently and voted for a limited suffrage bill in 1919. During the special session in Nashville in August 1920, a united Shelby County delegation introduced the 19th Amendment for consideration. Hanover’s zealous support for ratification impressed national suffrage leader Carrie Chapman Catt. The second youngest member of the House, he became the floor leader and attended strategy sessions at The Hermitage Hotel. He worked so tirelessly that he lost 20 pounds, and his work was so effective that he became the target of anti-suffrage plots. Governor A. H. Roberts appointed a special bodyguard to protect him. He spent more than 50 years as a Memphis attorney, civic leader and humanitarian, and he was especially proud that, as an immigrant and a Jewish-American, he was able to contribute significantly to the victorious fight for woman suffrage. According to his family, President Woodrow Wilson called him the day after the vote to congratulate him on his success. Frances Grant Loring, a sixth generation Memphian, spent her life trying to build a better community wherever she was. She empowered women and minorities, helped further literacy, supported adult education, and was passionate about civil rights, racial and religious justice. A Humes High School valedictorian, she became an attorney who left an indelible mark on the local law community. She attended Vanderbilt University, earned a law degree from the Vanderbilt School of Law at age 21, and tied for the highest grade on the Tennessee bar examination. After graduating from law school in 1944, Loring went into private practice, but she left Memphis in 1949 to join the Religious of the Cenacle Order and served in New York, Chicago, and Rome. In 1965, she was granted permission to leave the order to pursue a doctorate in theology and, subsequently, taught theology and chaired the theology department at Christian Brothers College. Eventually, Loring returned to private law practice in Memphis, where she was a member of the League of Women Voters and was active in civil rights, including the 1968 Sanitation Strike, when she marched with Dr. Martin Luther King, Jr. In 1976, she ran unsuccessfully for Probate Court judge. A founding member of the Association for Women Attorneys in 1979, she was the first recipient of the AWA’s annual award — the Marion Griffin-Frances Loring Award — named in honor of Loring and Griffin, the first woman attorney licensed to practice in Tennessee. She was a member of Network of Memphis and the Metropolitan Inter-Faith Association, as well as a founding member of the Tennessee Lawyers Association for Women.